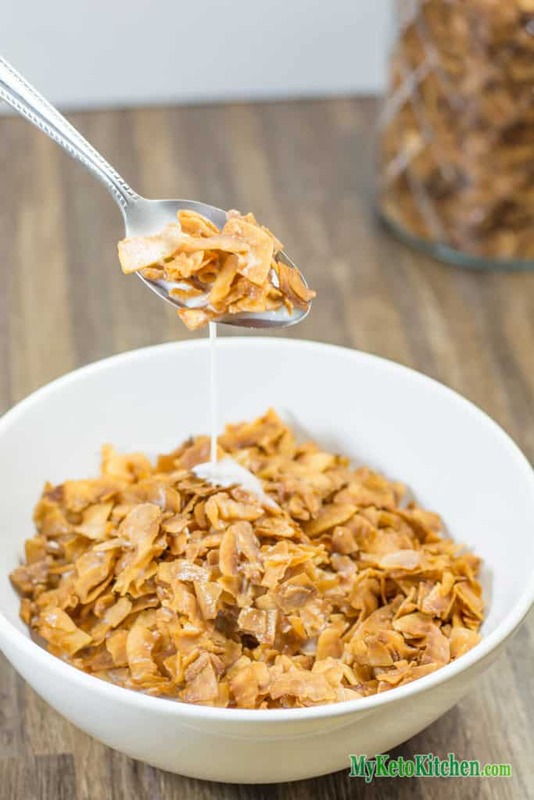 Our Low-Carb Cereal recipe “Breakfast Coconut Frosted Flakes” contains just 4 ingredients. This delicious super low-carb crunchy breakfast cereal will amaze you. 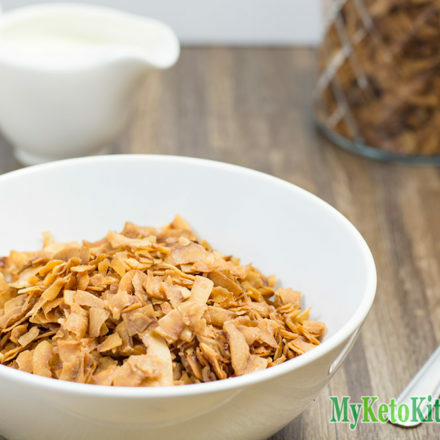 Serve this crunchy cereal with your favorite low carb milk or sprinkle over full fat or low carb yogurt. For something different try our Cinnamon Keto Cereal! The low carb cereal recipe makes 8 serves, a serve is a loosely packed half cup. It can be stored in an airtight container in a cool place for up to 2 weeks. Ensure that the cereal is fully cooled before storing, as any warmth will create moisture in your container and cause the coconut to go soft very quickly. Line a large cookie sheet or roasting dish with parchment paper and set aside. Add the coconut and Natvia icing mix into a large mixing bowl and mix gently. In a separate bowl, add the egg whites and whisk until foamy. Pour the egg whites into to the coconut, add the vanilla and mix well. Ensuring all the coconut is covered in sweetener and egg white. Pour the mixture into your lined dish and spread out evenly. Place in the oven and leave to cook for 15 minutes, stir through. Continue to cook for another 12 minutes, stir through again and drop the temperature to 120C/250F. Cook for a final 10 minutes. Remove from the oven and stir well, if there are still uncooked patches of coconut then return to the oven for another 5-8 minutes. Turn the oven off and leave the coconut in the oven for 10 minutes to dry. After this, leave the door ajar for another 30 minutes. Remove from the oven and allow to cool completely before enjoying or store in an airtight container for up to 2 weeks. This delicious super crunchy cereal will have you getting excited for breakfast every day. 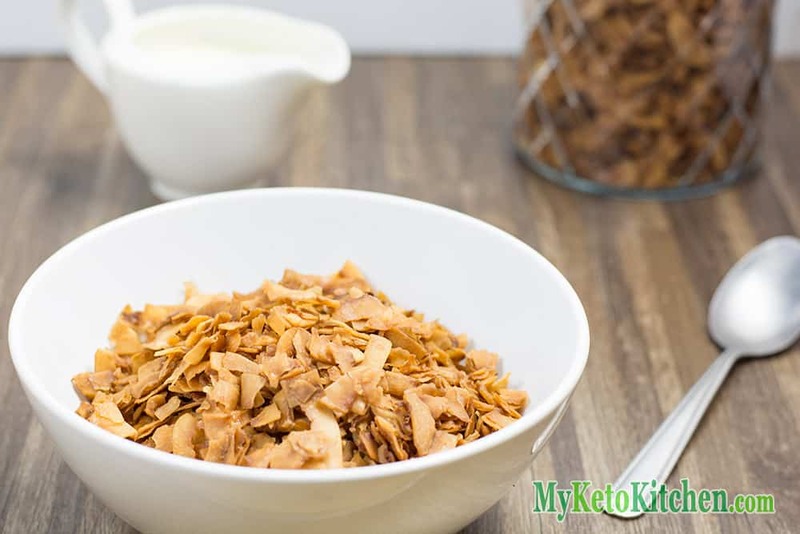 Our Low Carb Cereal - Breakfast Coconut Frosted Flakes contains just 4 ingredients. To make Low Carb Cereal in a larger batch simply adjust the serving amounts in our easy to use recipe card above. I love how this just looks like regular cereal, even though it’s a healthy homemade alternative. Hi there. Can swere or Erythritol be subsituted at the same ratios? Can’t wait to try this! As long as you are using a powdered or confectioners sweetener than the ratios are the same. We hope you love it as much as we do! 11 Best Cauliflower Recipes – “Low-Carb & Keto Friendly” – 100% Delicious! 27 Keto Christmas Recipes – Low-Carb Dinners, Sides, Treats & “Desserts” Too!